No surgeon or physician can accurately assess the progress of a disabling pathologic condition or its response to treatment without a long period of observation through follow-up services and outpatient clinics. 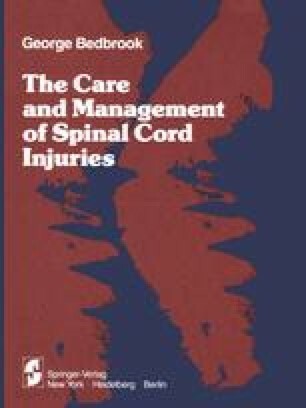 This is especially applicable to the condition of spinal paralysis where normal physiologic systems of the body are affected by either the primary lesion or complications resulting from that lesion. On completion of the patient’s hospitalization the residual disability may vary from apparent complete recovery to complete disablement, as in the case of a high tetraplegic.